I love Asian food, especially Thai, but when it comes to cooking it in my own home, I’m often left confused. Mostly by the ingredients. Why kaffir lime, won’t normal lime do? Egg noodles or rice noodles? What sort of eggplant? And what are these peas in the curry? After a morning spent at a Thai cooking class in Phuket with Pat, I feel more confident in my ability to create a delicious Thai meal. 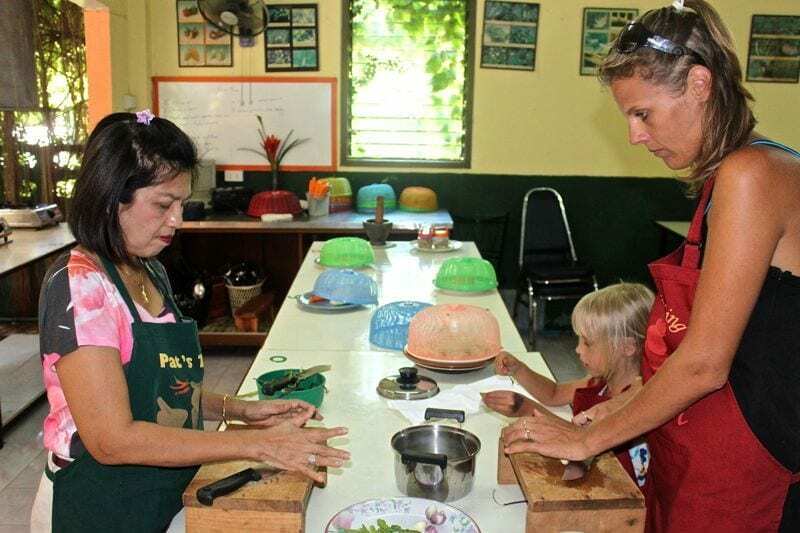 Pat is a local Thai chef who has no interest in having her own restaurant, she feels helping tourists learn how to cook Thai food from her own home is far more enjoyable. She spent 3 years perfecting the art of Thai cooking at the “Green Cafe” on the infamous Melrose Street in LA. However, she says most of her learning came from growing up as a child in her family kitchen. It made me squirm to know I was not (yet) passing down any culinary magic to my children. 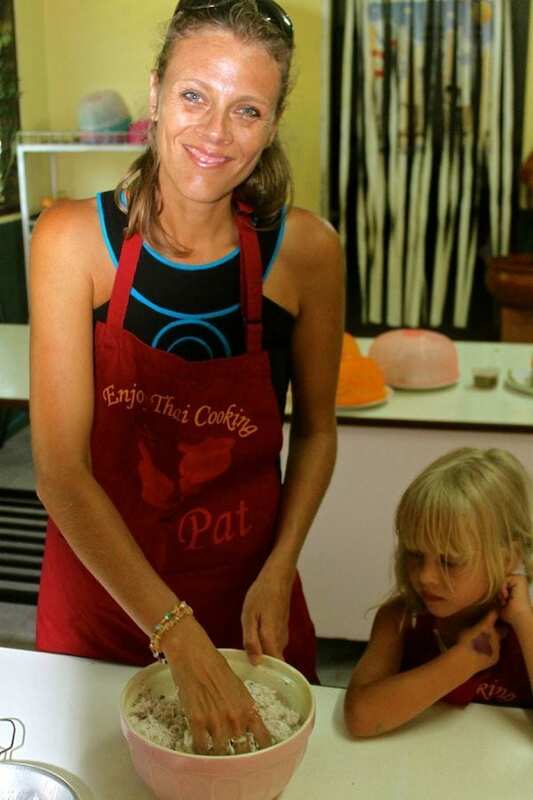 Pat has been teaching tourists how to cook Thai food for 16 years, hers was the very first Thai cooking school in Phuket. Newspaper and magazine articles lining the walls of her kitchen tell the story of her success and appearances on international TV shows, including an Australian cooking show in 2012. I relaxed into the wok knowing an expert was about to unlock the Thai cooking magic my family desperately craves. Our first stop was the local markets nearby Pat’s home in Phuket Town. 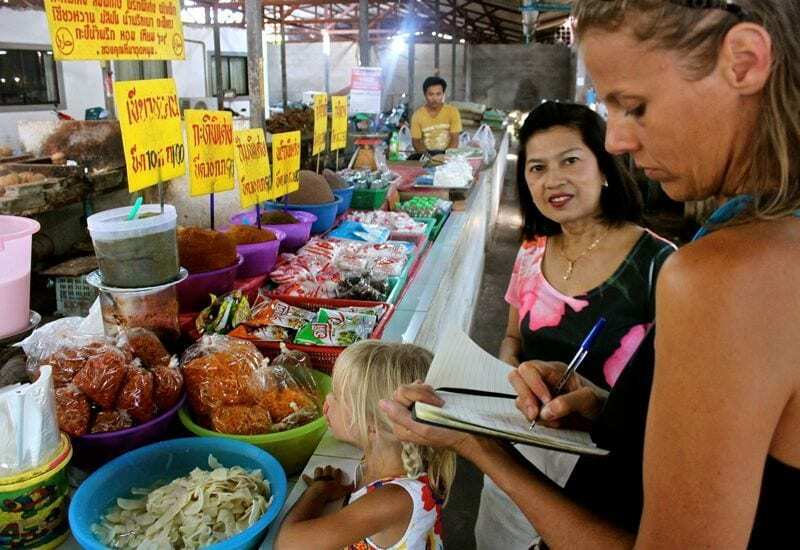 She quickly moved from stall to stall picking up the fresh fruit and vegetables explaining what they were and how they were used in Thai cooking. We hadn’t even started cooking yet and already I felt I had learned so much and was begging to unravel the mystery to cooking decent food at home. 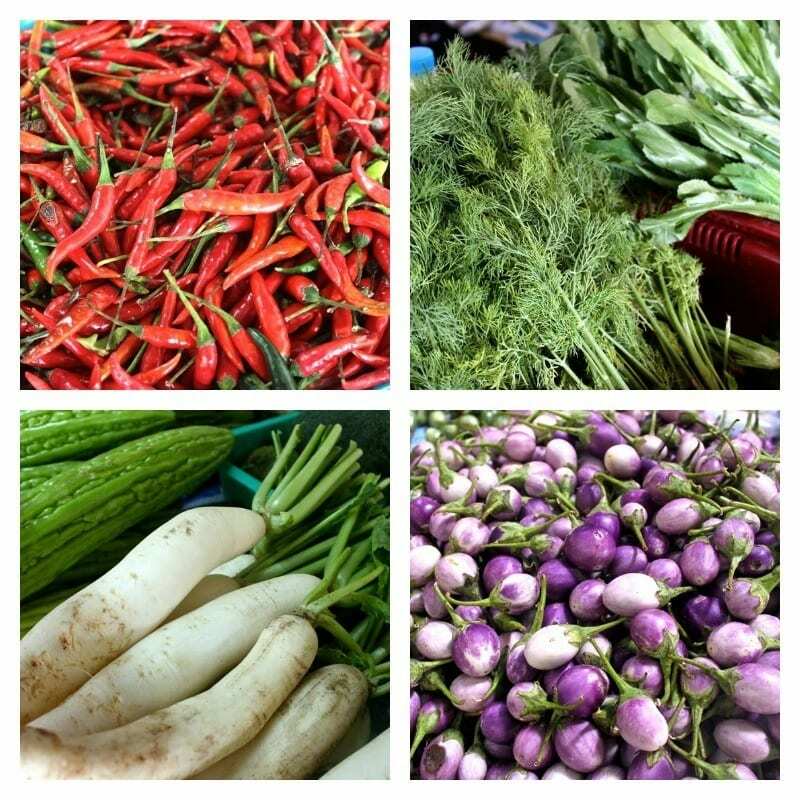 (Step 1 – Have a decent local market!) 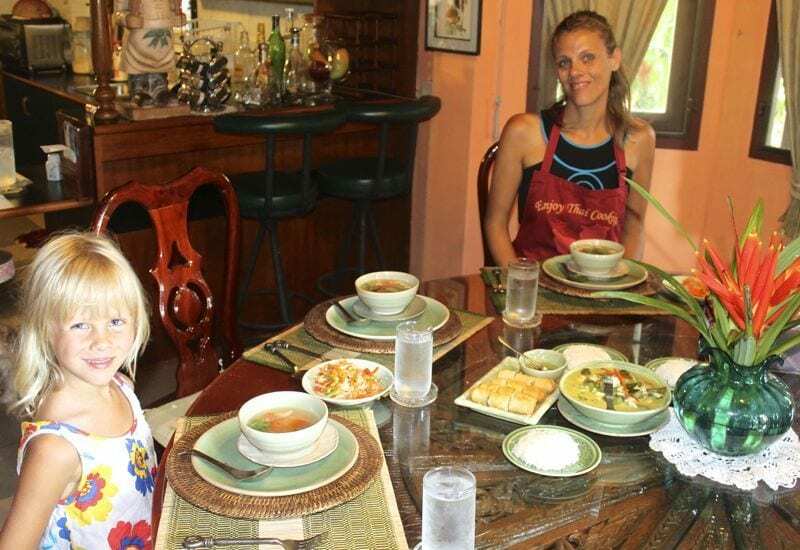 Maybe Kalyra would no longer complain about my cooking and would relish my Thai dishes as she had been doing the past week in Thailand. Kalyra’s favourite shows on TV are Masterchef and My Kitchen Rules and she has always loved to help me cook. She followed Pat and I around the market. “Let me smell” she grabbed a lemongrass stalk. 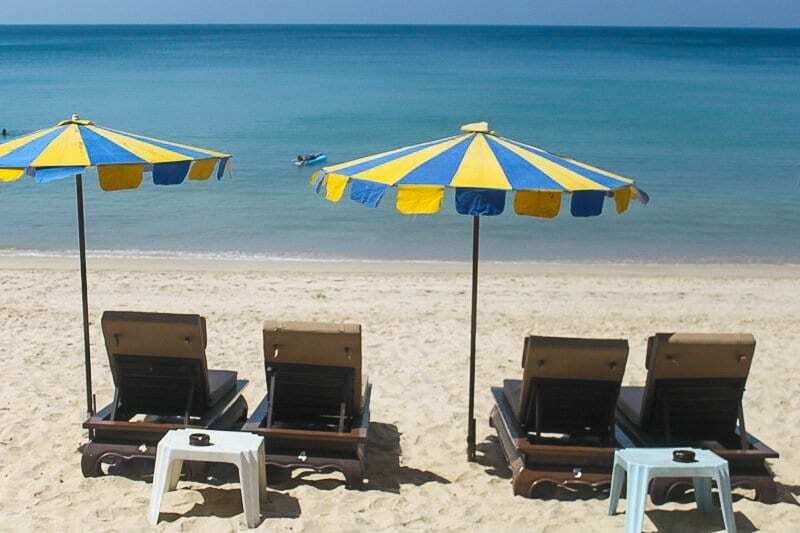 We sat under the shade at a table and chair in front of the kitchen sipping an iced lemongrass tea, while Pat prepared for our lesson. “Okay start class.” a short sharp clap gets us moving to the bench. The food tastes good. Authentic. I savour every bite knowing the hard work that went into preparing it. Pat doesn’t like to go over this number of students, preferring the more intimate style and ensuring she can give all her students adequate attention. The open air kitchen is a double sized garage attached to the side of the house. On two benches sit rows of woks and pots on gas burners and two rows behind that are cutting boards, knives and mortar and pestles. ready for food preparation. The kitchen clean and sparse; the only things present are the tools and ingredients needed for our dishes. (Step 2: Have an organised kitchen). 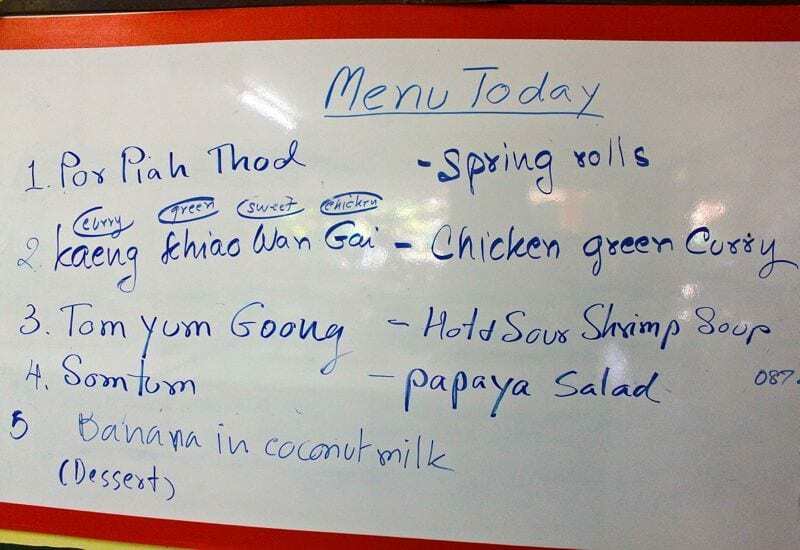 The white board at the back lists our menu for the day: spring rolls, green curry, Som tum, tom yung goong and bananas in coconut milk. Some of my all time favourites. Pat tries to tell us that Kalyra is too young for the cooking, but she is yet to understand my willful daughter. She dons the apron and sticks close to my side. 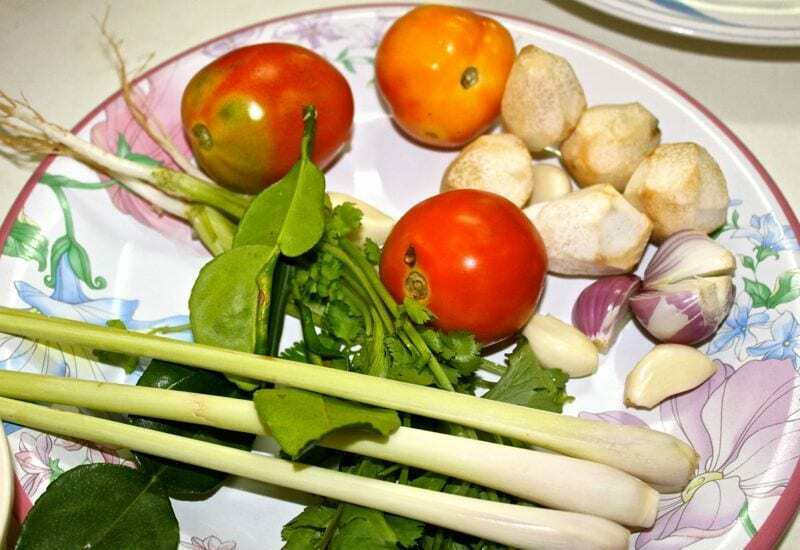 We prepare first for the green curry. 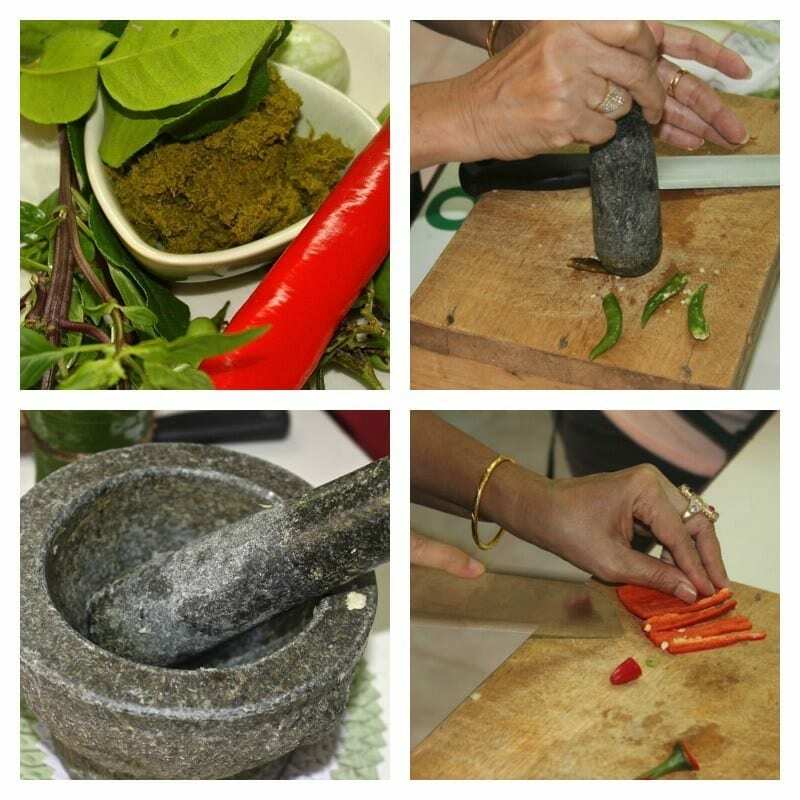 Pat explains the different ingredients we use and then we start chopping, slicing and bashing with the mortar and pestle. 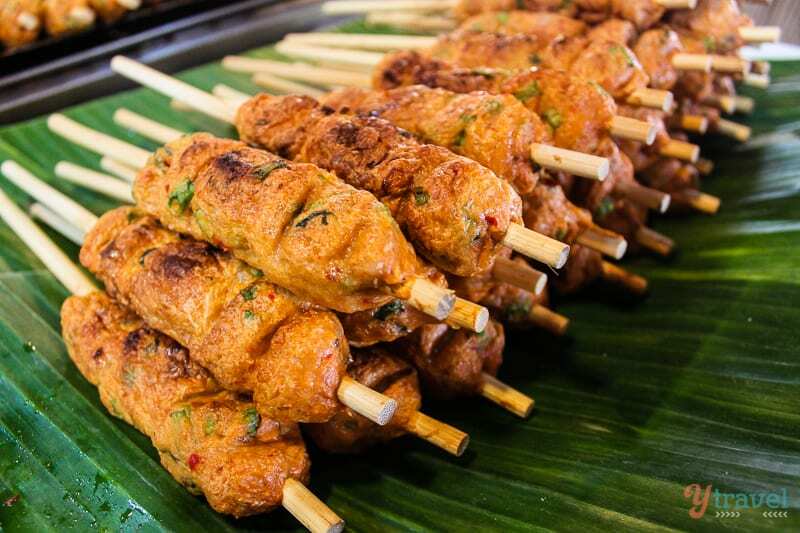 It’s not long before the spices of the curry paste hit our noses and we are ready to move to the next dish. There are no quick fixes or packets of convenience in this kitchen; it is all done by hand from the beginning. Starting with coconut milk. 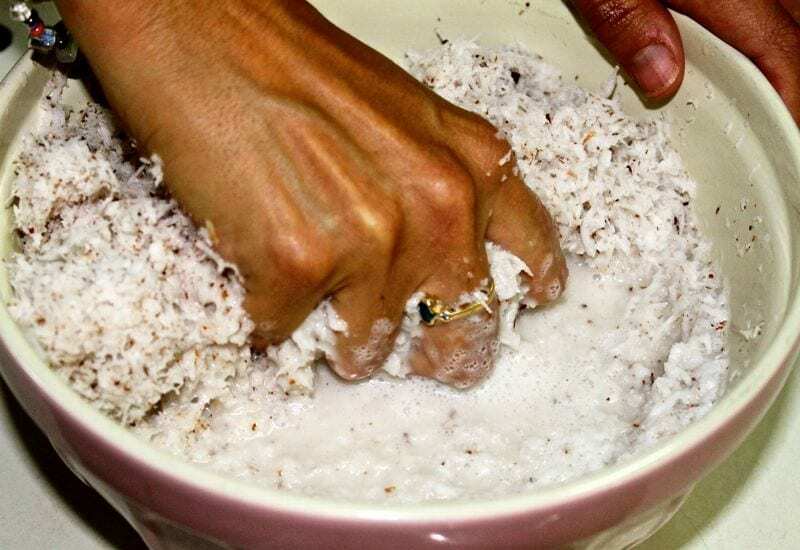 There is something so primal about squeezing the coconut meat with water to create milk. It’s a long process, but I’m excited to know every element of the dish comes from a labour of love – isn’t that what gets the judges handing out tens on these cooking shows? Maybe I am not a dreadful cook after all, as this is what I have always done, taught to me by my good friend Jintana who gave me cooking lessons in Bangkok in 2003. I remember this tip and not much else. 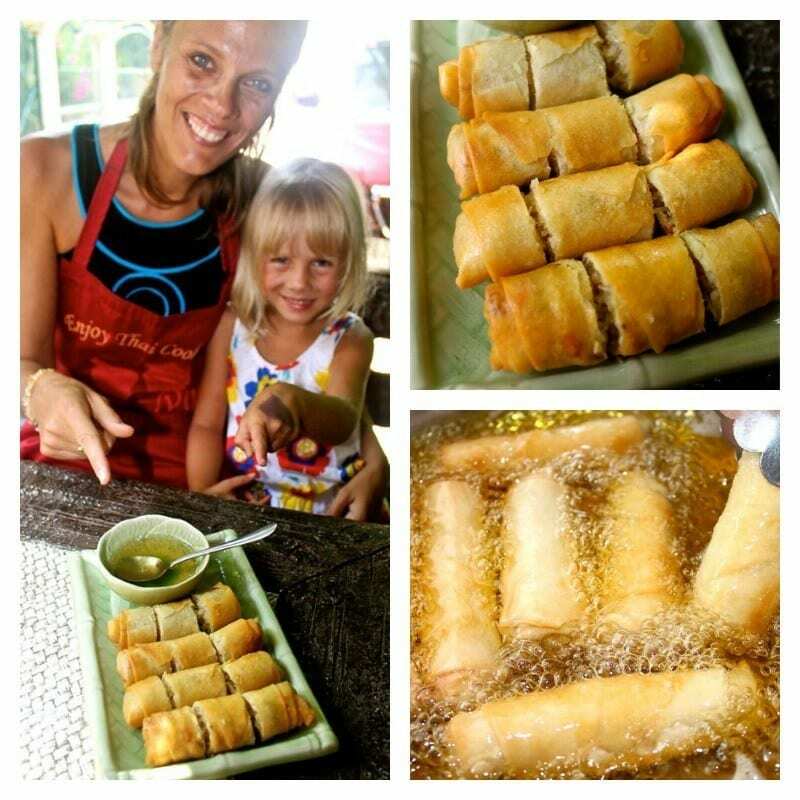 Kalyra embraces the rolling of the spring rolls, a task easy enough for her to do, although Pat wanted a little more tightness in the rolls and would stop to reroll a couple. I didn’t care if the spring roll would fall apart frying in the oil, I was happy for Kalyra to be enthusiastically rolling and learning alongside her. Kalyra wore a frown several times when there were tasks she could not do like chopping with the knife and stirring over the hot stove. But she helped me peel the kaffir leaf and grate the mango for the Som Tum. And we both enjoyed the smells of sweet basil wafting up as we peeled and chopped. The creation of each dish is simple, with few ingredients and little cooking time. Once you understand this, it is not challenging to create a 10 point Thai dish. Or maybe it’s just because Pat is standing there to guide me with each step. After a couple of hours of chopping, grating, mashing and cooking, it is time to sit and eat. Pat has prepared the dishes on the table inside her home. She busies herself with paper work while we sit and eat as a family. Well try to. Savannah has her exploration boots on, but Pat’s assistants play with her in between cleaning. This was the food we came to Thailand for. 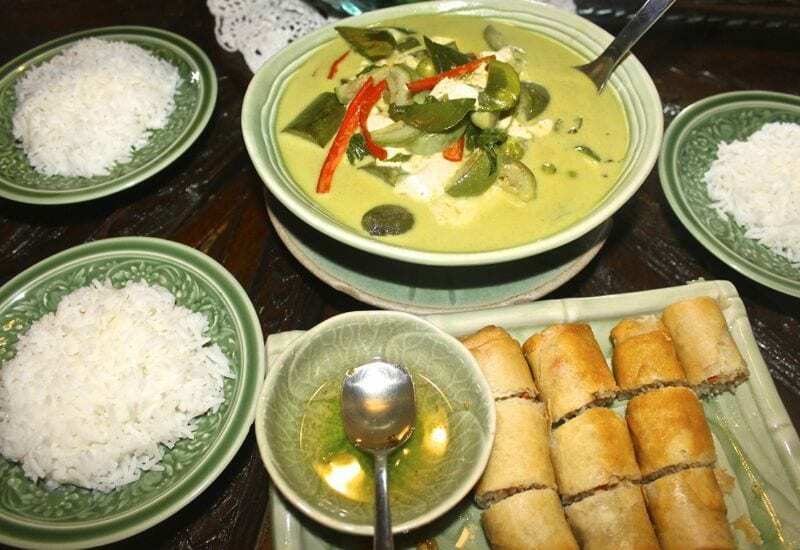 My body zinged with each mouthful and the creaminess of the curry rolled around in my tummy and made me coconut happy. Fresh from the source from market to belly, no tainted, packaged or processed food. I knew what was put into my body was pure energy and was being put to good use, cleansing, restoring and revitalizing. I felt replete. The banana in coconut milk added a touch of sweetness to end the meal. Just enough. Not the fullness of a western desert piled high with fat, sugar and calories, but light, healthy polish to the entire Thai meal. 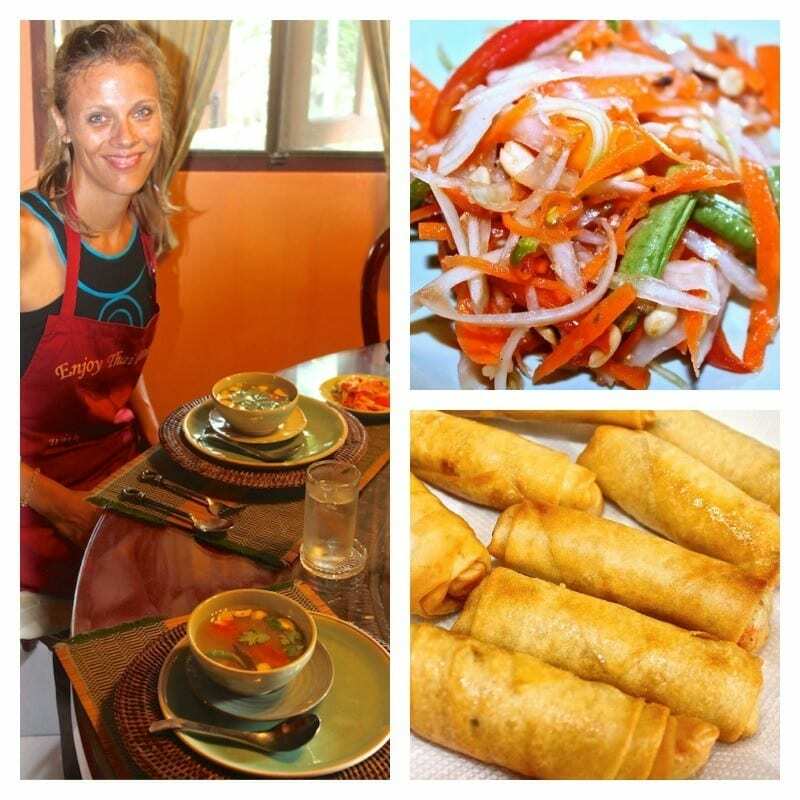 To learn more about how you can join Pat in her home in Phuket for a traditional Thai cooking class visit her website. 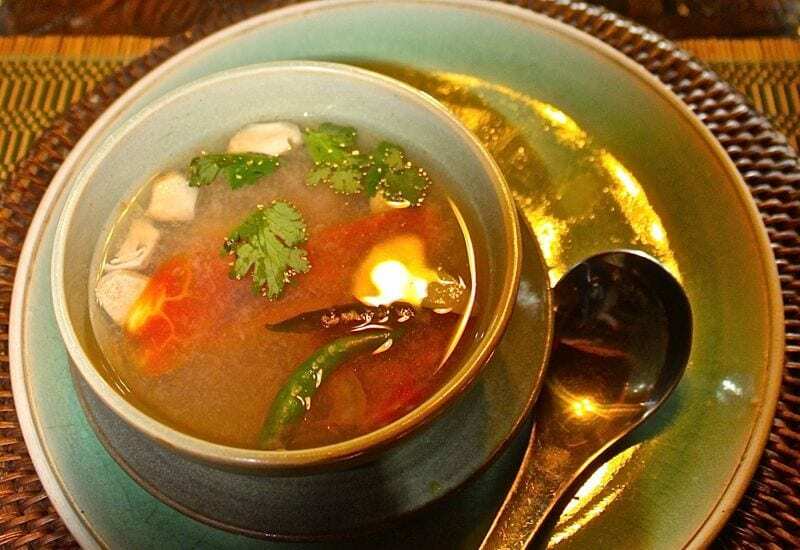 In the comments section down below, tell me: Which Thai meal would you love to know how to cook? I don’t have the patience to cook like this… which is why I love cooking classes. Looks tasty and fun. It sounds like you had a great time learning to cook. 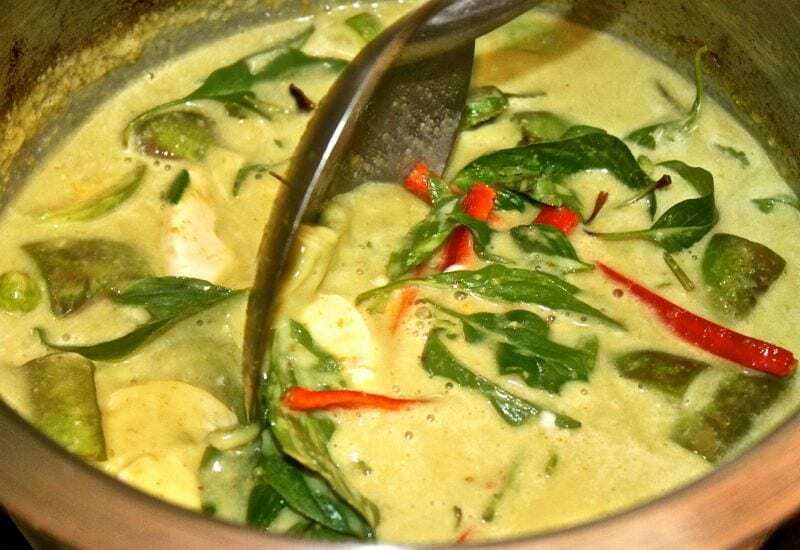 Tom Yum is great, but I really like Green Curry. I’m surprised that I’ve never heard of this place, it’s only about 10 minutes from my house. You must check it out Lawrence. 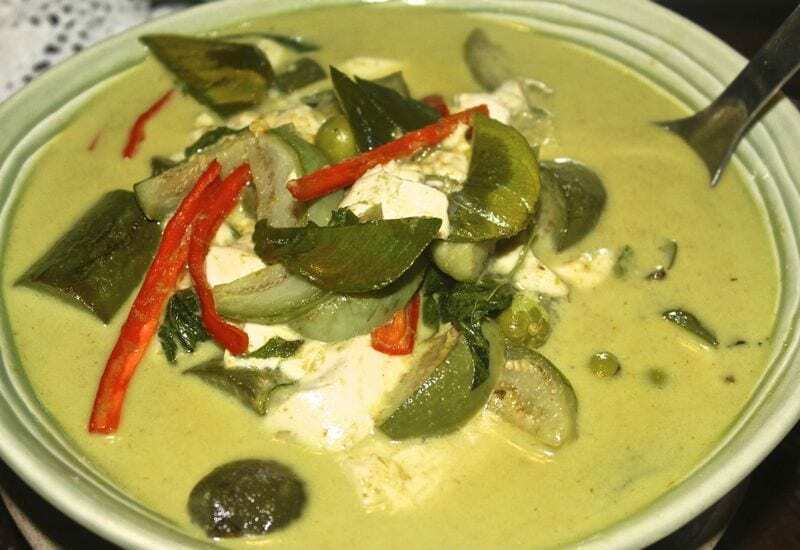 Really worth it My Green curry rocked!! Thai cooking always seems so complicated and intimidating. It’s always best to learn and get to know the ingredients and what exactly to purchase before actually learning how to cook a meal. Everything on the table looks so yummy! I have a wonderful Thai cookbook at home that I love using; the problem is finding the ingredients. Kaffir lime leaves becomes lime juice, which often becomes lemon juice because it is in the fridge. Even with many substitutions, it still tastes great to make as much as you can from raw ingredients. 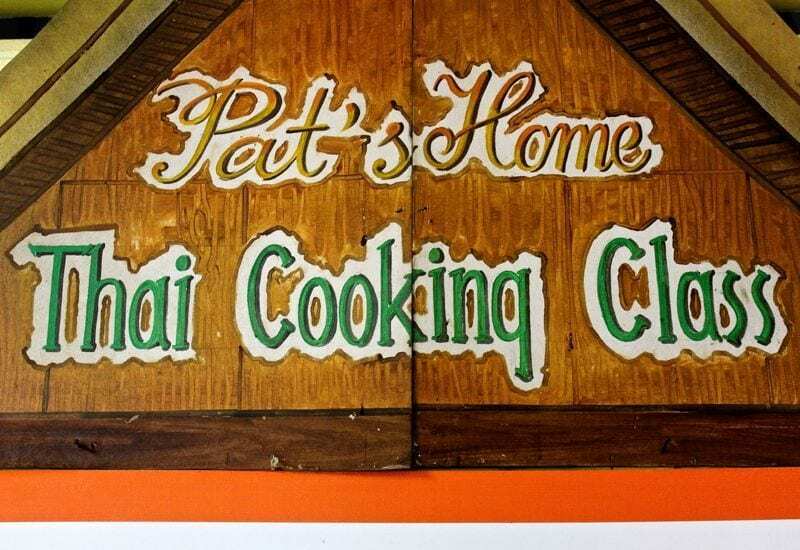 Next time I’m visit Thailand I think a cooking class will be in order. Ha Ha Tim, you sound just like me. I always end up with the lemon juice as well!